For the second time in two years, La Niña has formed just in time to transform winter weather around the world. 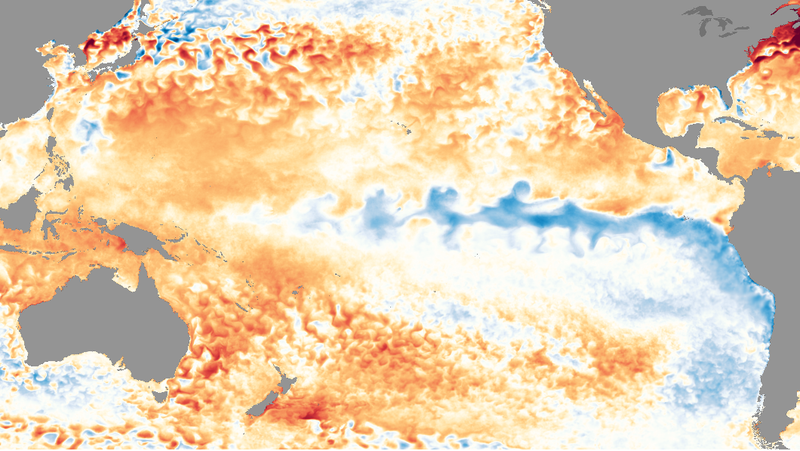 On Thursday, the National Oceanic and Atmospheric Administration (NOAA) declared “game on” for La Niña after analyzing October ocean temperatures and crunching the numbers for their seasonal forecast. The phenomenon could bring a whole host of weather impacts from snow in the Northwest to heat in the South through spring. La Niña is declared when temperatures in the eastern tropical Pacific dip 0.5°C or more below normal in the eastern tropical Pacific, a region dubbed NINO3.4 for my Niñaheads out there. Those cooler waters have an influence on the atmosphere by decreasing evaporation in the tropics, which in turn rearranges weather around the globe. It’s basically a planetary Rube Goldberg machine. The last component for calling a La Niña official is scientists feel confident that those conditions will remain in place for the next few seasons, which they measure in three-month running averages. The La Niña declaration is a bit of surprise if you were been watching forecasts all summer (and really who wasn’t). NOAA and their partner the International Research Institute for Climate and Society had been bullish on neutral conditions for the fall and winter. But things started to change in September. This is the second La Niña of the year. The previous La Niña formed in late fall (in fact, it’s almost a year ago to the day the other La Niña was declared) and lasted until spring. This is the fifth instance of a double dip La Niña. Like the 2015-16 La Niña, this one isn’t projected to be a major one. Forecasters are expecting weak conditions to remain in place through the spring. “The forecast is for a weak event which means that impacts aren’t necessarily as reliable as during a stronger event,” DiLiberto said. And really, those impacts are what you’re here for. So let’s cut the nerd talk and get to what really matters. If you live in the U.S., you can expect La Niña to influence the weather this winter. La Niña generally means wet, cool weather in the Northwest and dry, warm conditions across the southern tier of the U.S. That’s good news if you’re a skier in Seattle, bad news if you’re a farmer in the Georgia. And lo and behold, the U.S. winter forecast from NOAA sure looks a lot like La Niña with increased odds of wet, cool weather to the north and warm, dry weather to the south. Other parts of the globe will also likely see weather shifts as the cold waters in the Pacific reorganize the atmosphere. That includes wet conditions in northeast Brazil, cool weather over West Africa, and dry and cool conditions around Ecuador and Peru. More broadly, the planet tends to cool slightly as the chill in the Pacific spreads throughout the atmosphere (El Niño, the opposite phase of La Niña, heats things up in comparison). It means 2018 is unlikely to set any global temperature records, though it’s still likely to be way warmer than average. The return of La Niña also puts 2017's near-record global heat in perspective. This year will likely go down as the second-hottest in history, trailing 2016. But last year got a boost from the monster El Niño, which added somewhere around 0.1°-0.2°C to the overall global heat. In some ways, that makes 2017 stand out even more remarkable. It will be the warmest non-El Niño year on record and by far the warmest La Niña year. In that context, it goes to show that while La Niña and El Niño still definitely have an impact on the planet, climate change is playing an ever bigger role.